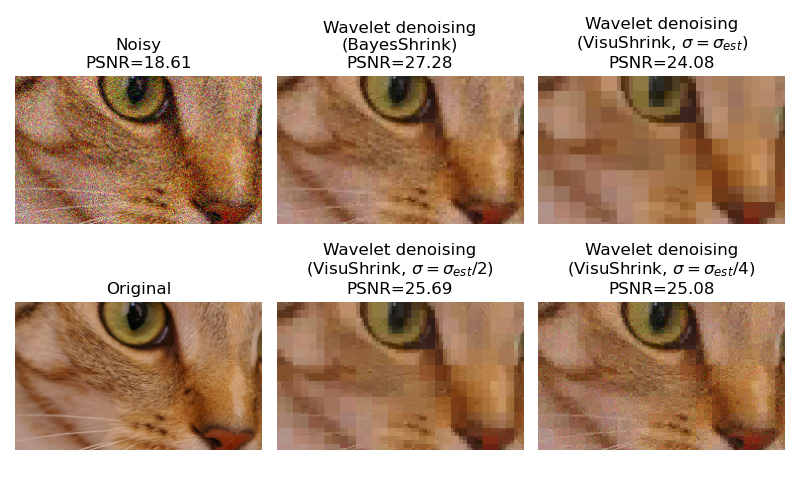 Wavelet denoising relies on the wavelet representation of the image. Gaussian noise tends to be represented by small values in the wavelet domain and can be removed by setting coefficients below a given threshold to zero (hard thresholding) or shrinking all coefficients toward zero by a given amount (soft thresholding). In this example, we illustrate two different methods for wavelet coefficient threshold selection: BayesShrink and VisuShrink. The VisuShrink approach employs a single, universal threshold to all wavelet detail coefficients. This threshold is designed to remove additive Gaussian noise with high probability, which tends to result in overly smooth image appearance. By specifying a sigma that is smaller than the true noise standard deviation, a more visually agreeable result can be obtained. The BayesShrink algorithm is an adaptive approach to wavelet soft thresholding where a unique threshold is estimated for each wavelet subband. This generally results in an improvement over what can be obtained with a single threshold. # in the threshold by factors of 2 and 4.